The Spinsterhood Diaries: Spinster Thoughts: Bananas! Last week I showed you a photo of my banana painting while it was still a work in progress. It is now finished and dry, and I've taken an admittedly low-quality photo o fit this morning. 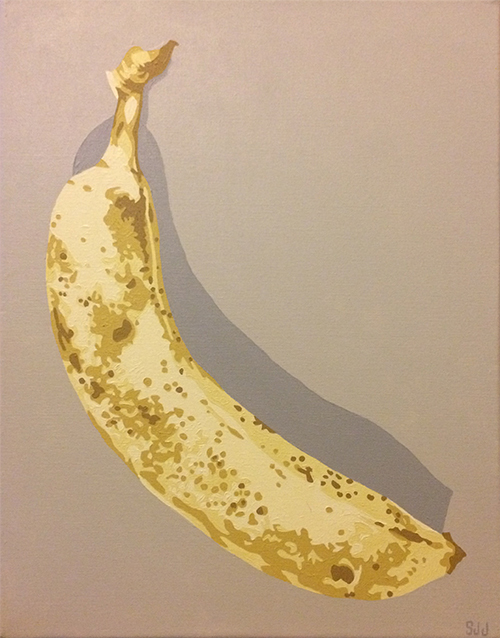 I made this painting by referencing a photo I took of a banana that was in my apartment. I like bananas, so I thought this morning we could talk about them. 1. There is an International Banana Club based in California, and they have an International Banana Club Museum. The photos look amazing. 2. A friend told me over the weekend that eating bananas attracts mosquitos. According to NBC News' mosquito experts, though, this is an old wives' tale. 3. According to the Chiquita Banana website, bananas are actually giant herbs...who knew? 4. The bananas we eat are clones, and that specific variety might be in trouble. However, scientists are working to breed a more diverse population of bananas that may be able to help. 5. Bananas contain tryptophan. They are also slightly radioactive. So, enjoy a banana today! And then maybe get this banana hoodie.